Tips and Techniques: DATERANGE function - by month and year – How can we help you today? You have already learnt about the DATERANGE function in an earlier Tips and Techniques article. 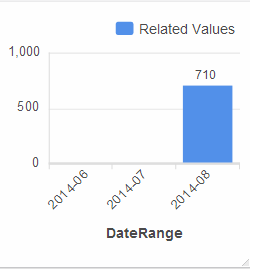 As you know, the DATERANGE function returns days between a start and end date. But in this article the X:Axis returns the month and the year for the last three months using the DATERANGE function. 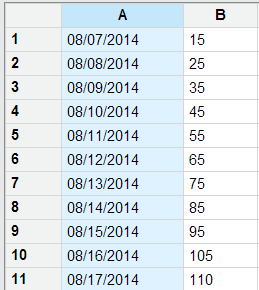 The Series then references this formula and uses the GROUP and GROUPBY functions to return a unique instance of the month and year, and then sums related values. To average values, in the GROUPBY function select method and type in average(values) using the Insert literal string or number button. Tip: Get in the habit of evaluating your formulas to ensure the correct results are returned (with the Evaluate button ). Use the evaluate button if you suspect the data source uses count(values) as a method in the GROUPBY function to count the number of records being summed. The DATE_CONVERT function converts the date format that displays in the data source to the date format that displays on the X:Axis – year-month (yyyy-MM). Skill Building Question: Why did I use the LOOKUP function? If you have June and July values, you can use the formula: GROUPBY( DATE_CONVERT( A:A , “M/d/yy” , “yyyy-MM” ) , B:B , method ) for the Series.